Step 1 : Make Amazon Alexa Skill (Amazon Alexa herself. 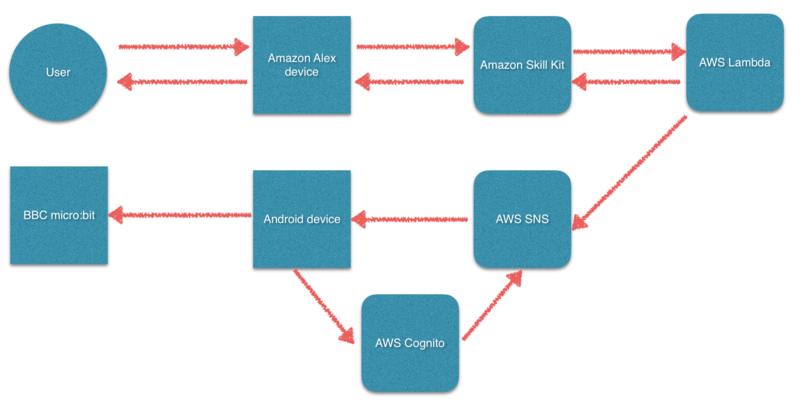 Step 2 : Make AWS Lambda (amazon Alexa's logic. With this skill, kids can ask Amazon Alexa the current weather. The result will display on BBC micro:bit LEDs. This is a sample that connects Amazon Alexa and BBC micro:bit. Go to https://developer.amazon.com/edw/home.html#/skills/list and click "Add a New Skill ". Select Skill Type: Custom Interaction Model , and input Name and Invocation Name , Click Next . Input Intent Schema and Sample Utterances, and click Next . Then you can test the skill, if you finish Publishing Information and Privacy & Compliance, you can submit for Certification . In the next screen, click Create function. Then you will see ARN, fill the arn to Step 1's arn field. Go to http://openweathermap.org, and sign up a account, and you can find API key at your member page. Replace your app id by the key. Now you can find the ARN, replace android source by this arn (if necessary, modify Region field to your region). Input Topic name and Display name, then click Create topic. You can find topic ARN, and replace lambda source and android source. (if necessary, modify Region field to your region). Go to https://console.aws.amazon.com/cognito/federated/?region=us-east-1 ,click Create new identity pool . Input Identity pool name and check Enable access to unauthenticated identities .click Create Pool . In the next screen click Allow. You will find the cognito ARN, and replace android source by this arn (if necessary, modify Region field to your region). Go to https://console.aws.amazon.com/iam/home?region=us-east-1#/roles , select your cognito role name such as Cognito_xxxxxUnauth_Role. Add SNS permission such as below picture. Go to https://firebase.google.com ,you can Create new project ,and you can find Server key on Settings ' CLOUD MESSAGING tab. Fill this information to Step 4 : Send weather information to Android Device. Create firebase android app ,then download the google-services.json file from your firebase console, replace android source file. Use Android Studio import downloaded project, modify the arn information and firebase information, build app to android device. Step 6 : Let micro:bit run! When you back to Blocks, you will see like below picture. Transfer this program to micro:bit. and DONE! You can find the source of each part in sub folders.